A 2CD set featuring the score by John Scott and songs by Keith Easdale from the film by Wicker Man director Robin Hardy that follows similar themes to the 1973 cult classic. The story of two devout Christians who become enmeshed in the strange ways of a Scottish community, the music and songs are once more a driving force of the film’s story, much like its predecessor John Scott’s music career extends to over sixty years of writing and composing. As an arranger, conductor and musician his work appears on many classic 1960s hits, not least playing flute on The Beatles’ You’ve Got To Hide Your Love Away and lead sax on Goldfinger. His film and TV composing career extends to over 140 titles (Greystoke: The Legend Of Tarzan, Lord Of The Apes, The Cousteau Odyssey). He is a celebrated classical composer and has conducted many of the world’s leading orchestras including The Royal Philharmonic Orchestra who perform The Wicker Tree score. 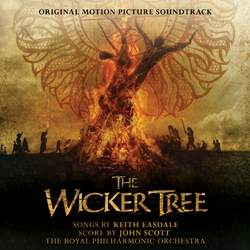 Traditional Scottish artist and composer, Keith Easdale, provides songs that propel the story and he was present throughout the production to supervise the music which has been described as the spine of the film.